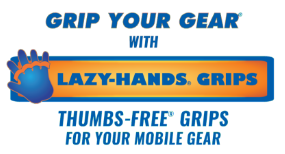 Mobile phones, tablets, walkies, eBook readers - why hold it, when you could grip it with a cell phone hand grip from LAZY-HANDS? Keep your technolgy gear, including smartphones, iPhones, iPads, tablets, eBook readers, clean and in one piece by avoiding pointless drops. When you invest in a hand grip for phones or a hand holder for tablets, you are investing in the safety and overall maintenance of your device.